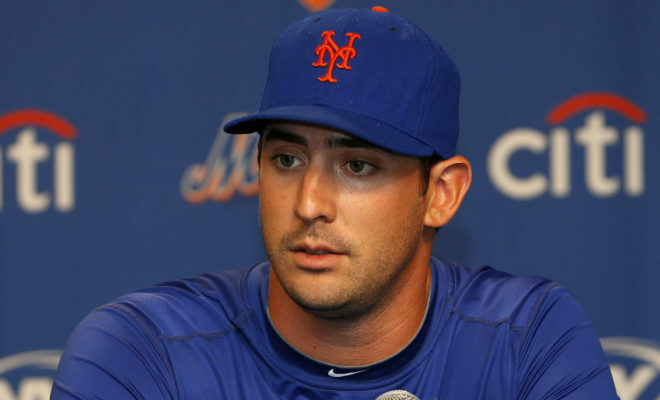 Matt Harvey is a professional baseball player who currently plays for the Major League Baseball side Cincinnati Reds. Harvey, who plays as a pitcher, had previously featured for the New York Mets where he was given the nickname The Dark Night by Sports Illustrated Magazine following comparisons made between him and Batman. Matthew Edward Harvey was born to Jackie and Ed Harvey on March 27, 1989, in New London, Connecticut. His father, Ed, who worked as a teacher and coached the Fitch Senior High School baseball team, his alma mater, was an athlete who played college baseball and football, most notably making an appearance in the 1972 College World Series. Harvey attended Fitch Senior High School where his parents were teachers. He played for his dad in the school’s baseball team and also featured for its basketball team. In his senior year, Harvey was considered a first-round draft pick as reputable baseball magazine, Baseball America, ranked him as the best high school prospect. Things did not go as envisioned for the young athlete as he was selected in the third round of the 2007 MLB Draft with the 118th pick by the Los Angeles Angels. So rather than going into the league with uncertainty about how his career will pan out, Harvey opted to attend the University of North Carolina (UNC) and play college baseball. Matt Harvey went on to star for the UNC Tar Heels, pitching for the school for three seasons before going professional in 2010. He was this time around selected with the seventh overall pick by the New York Mets. Following stints at a few minor league teams, Harvey was eventually included in the Mets’ roster as the fifth starter for the 2012 campaign. He made his debut on July 26, 2012, in a game against the Arizona Diamondbacks. He ended his rookie season with a 3–5 record and an earned running average of 2.73 in which he recorded 70 strikeouts. In his second season, Harvey continued to impress with his arm strength and control which prompted his team manager to say he had the potential of becoming the best ever Mets pitcher. However, injuries and ineffectiveness began to limit the star player from meeting the high standard set for him. He underwent Tommy John surgery, thoracic outlet syndrome and had a stress fracture in the scapula that required surgery. All of this limited his appearances, at times for more than a season. The Mets eventually traded Harvey to the Cincinnati Reds in May 2018 where he currently competes. Matt Harvey got suspended for three games without pay by the New York Mets on May 7, 2017, for violating team rules. It was revealed that Harvey did not show up for a Mets game because he partied late into the night the day before. The suspension was however not a direct result of him missing a game but was due to a compilation of issues by the player that had stretched for over two years. Matt Harvey is currently signed to a one year $5,625,000 contract for 2018 after which he would become an unrestricted free agent. He was previously paid $4,325,000 in 2016 and $5,125,000 in 2017. Despite whatever on-field issues Matt Harvey had, he did not let it affect his taste in women as he dates high-class fashion models and television personalities which have inadvertently landed him on gossip columns. It is not clear which model the New York Mets pitcher is currently dating, however, he has most recently been linked to television personality Lo Bosworth and Polish-Ukrainian Instagram model Kristina Krishka having previously dated Brazilian supermodel Adriana Lima, Anne Vyalitsyna, AniaCywinska, Ashley Haas, among many others. Harvey and Lima’s were quite open as the pair had been spotted together at the River Yacht Club in Miami in March 2017 where they were said to be very cozy with each other, sharing kisses for everyone to see. But the relationship soon made headlines after she reportedly dumped him for her ex without a heads up. Matt Harvey is the only son and youngest child of his parents. He has two older sisters; Jessica and Jocelyn. While growing up, he was a huge New York Yankees fan and had the legendary Derek Jeter and Paul O’Neil as his idols. In high school, Matt Harvey was teammates with future Major League Baseball pitcher Jesse Hahn before he went off to play college baseball and study Sports Administration at UNC. On his Major League Baseball debut, Matt Harvey set a New York Mets franchise record for most strikeouts in a game. He also became the first player in modern history to strike out 10 or more batters and get two hits on their Major League debut with his total of 18 strikeouts which was also a Mets record for a rookie. He earned an All-Star selection in 2013 and was crowned the National League Comeback Player of the Year in 2015.